Yesterday (Saturday) morning, we thought we would do a walk that was suggested by one of my English language students. To join the walk, you take the Camino del Sacromonte from the edge of the Albaicin and just continue walking until you reach the open countryside. It’s interesting that when you wander around the Sacromonte area of Granada, you can see that you are literally on the edge of the city: to one side, you have spectacular views of the Alhambra and the sprawl of the centre, and in the other direction, you can see mountains and hills and trees. No suburban sprawl, just a quick change from one state to another. Sacromonte is a quirky corner of Granada. This is where the gypsy population settled in the 18th century, and its roots as a community are very much in evidence. Dwellings here were predominantly carved into the face of the Cerro de San Miguel, and the cave houses remain here today. This is also reputed to be the home and heart of Granada Flamenco, as this is where the gypsy element would have been strongest 200 or so years ago. Andrew and I both reserve judgment on this corner of Granada as we feel it is in danger of becoming too exploitative. We have been to one Flamenco concert at the La Chumbera venue, which is part-restaurant and part-auditorium. The views form here are spectacular, it must be said. Walking along the little tracks that weave across the hillside past the caves is interesting, but everywhere there are indications that this is becoming more of a tourist haunt and less of a genuine community. We did suffer slightly at the hands of one hostelry, set in a cave and with an eccentric host. The cave was full of quirky Flamenco-themed artefacts, which are fascinating, but the drinks were on the pricey side and the host not quite as full of bonhomie as perhaps he could have been. Along the Camino del Sacromonte, every cave bar or restaurant advertises its own Flamenco Tablao, and piped guitar music does its best to lure in the unsuspecting. Compared to the rest of Granada, where life is so laid back, charming, spontaneous and warm, I personally feel that Sacromonte is rather compromising its integrity. Anyway, all that aside, yesterday morning we walked up from The Paseo de los Tristes to turn right onto the Camino del Sacromonte and we made a little discovery to add to our Hidden Gardens list. On the corner of Cuesta del Chapiz and Camino del Sacromonte we saw a gate in a wall and a little sign bearing the legend Casa del Chapiz. “Ooh, let’s explore”, we agreed, and hopped through the gate. Documents list a property here from 1525 but it is likely that the site was originally occupied by an old Nasrid or Arabic country estate. The house was inhabited by the moorish family of Hernán López el Ferí and then inherited by his son-in-law, Lorenzo el Chapiz, after whom the property is named. 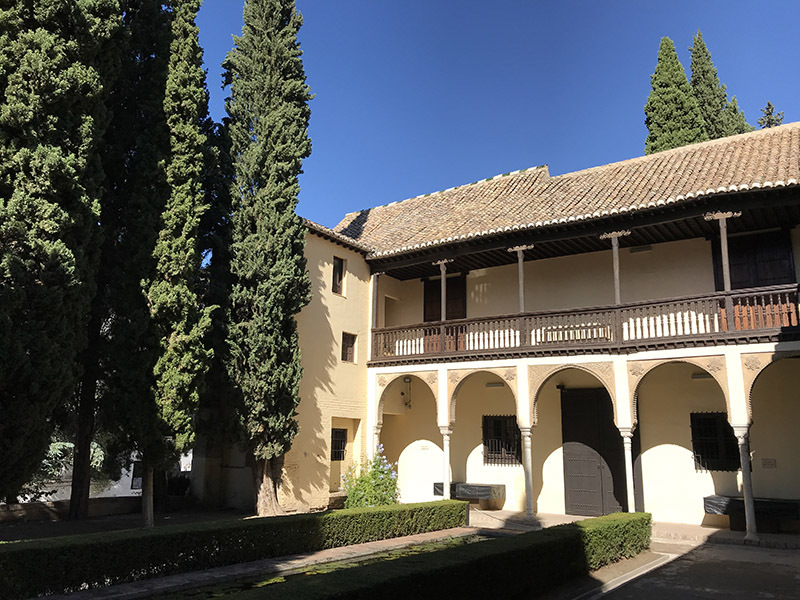 Following the expulsion of the moors from Granada, the property was acquired in 1571 by the Castilian Crown and was subsequently used for a variety of purposes throughout the centuries. The building was declared an Architectural and Artistic Monument in 1919 and ten years or so later, the adjacent orchard was bought and this is where the gardens were created in 1935. Both house and gardens, now, are a beautiful reminder of Granada’s heritage. The property itself, arranged around a typical open courtyard, is a glorious evocation of the traditional moorish heritage of the city and the gardens, even though they are relatively contemporary, are designed on the formal structures so evident in the Alhambra and the Generalife. This is yet another oasis of calm and tranquillity, and looking out over the box hedging towards the magnificent Alhambra provides probably one of the best, and possibly least-known, views of the Palace complex. So, after that delightful moment of calm, we continued on our walk, out past the entrance to the grand Abadía del Sacromonte, past odd Carmenes and rural casas that make up a rather forgotten corner of the city. Once you get past the caves, and the tourist haunts, the area takes on the guise of a place ignored. Across the valley, the hillsides are punctuated by the encampments of modern-day travellers - ramshackle shelters and tents - and there is a slight air of uneasiness. Gradually, houses give way to trees and fields and in the distance, beyond the valley, the Sierra Nevada rises, with the upper peaks now covered in the first snows of the season. The concrete road peters out into a dirt track and I have no doubt that this where the walk proper begins, into the rather glorious countryside that lies beyond. On this day, however, we turned back but will continue another day. Today, Sunday, we decided to visit another of Granada’s most historically significant buildings, the Real Monasterio de la Cartuja. After a fairly hearty breakfast in a cafe on Gran Via, we took the N7 bus (we are now getting the hang of the Granada bus system; their maps would be a disaster for anyone who suffers from colour-blindness), and all buses seem to either go from North to South or East to West and if you need to deviate from an as-the-crow-flies route, you need to be a solver of orientation riddles! However, the N7 is reasonably simple and did little to tax our Sunday morning brains. 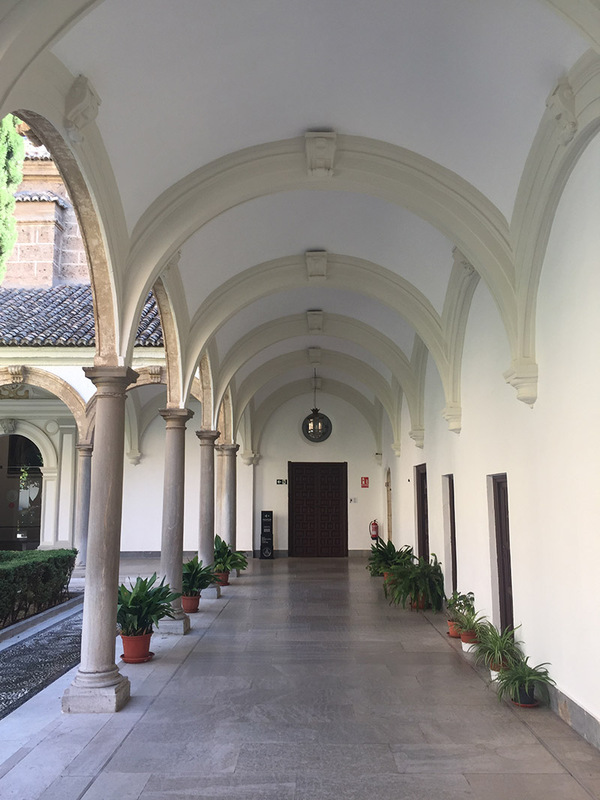 The Monasterio de la Cartuja is in a strange spot, as the Cartuja Campus of Granada University has now rather grown up around this magnificent Baroque structure. It sits on a corner, looking somewhat defiant, blasé about the modern world encroaching upon it. Originally the site of a Roman cemetery, and subsequently a moorish Carmen, the land was gifted to the Carthusian order of monks in 1506 for the building of a monastery. Although work began on the building in that same year, construction was not completed for over 300 years, and the Monastery that resulted is a mix of high Baroque and Renaissance architecture that is a glorious testament to the artists and designers who played a part in its creation. The main church and the sacristy, dating back to 1720, are in immaculate condition and are arguably the finest examples of Spanish Baroque architecture surviving today. 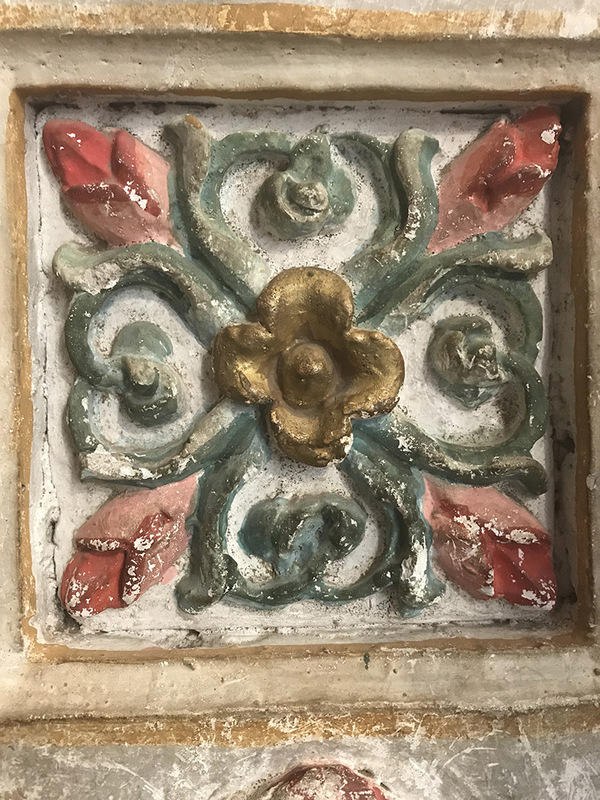 If you ever need a fix, or indeed an overdose, of Baroque embellishment, then come and immerse yourself in this shrine to stucco mouldings, gilt, marble and the use of light to create drama and atmosphere. A glorious collection of rich ecclesiastical sanctuaries arranged around a beautiful cloistered courtyard, peaceful in its simplicity, belying the ornate treasures that lie behind the modest doorways. Returning to the city centre on the N7 bus, we stopped to take a quick look at the splendid fountains at the top of the Jardines del Triunfo, yet another lovely garden in the heart of the city. Naturally, this was a fleeting visit as we were, by now, in need of a cerveza. 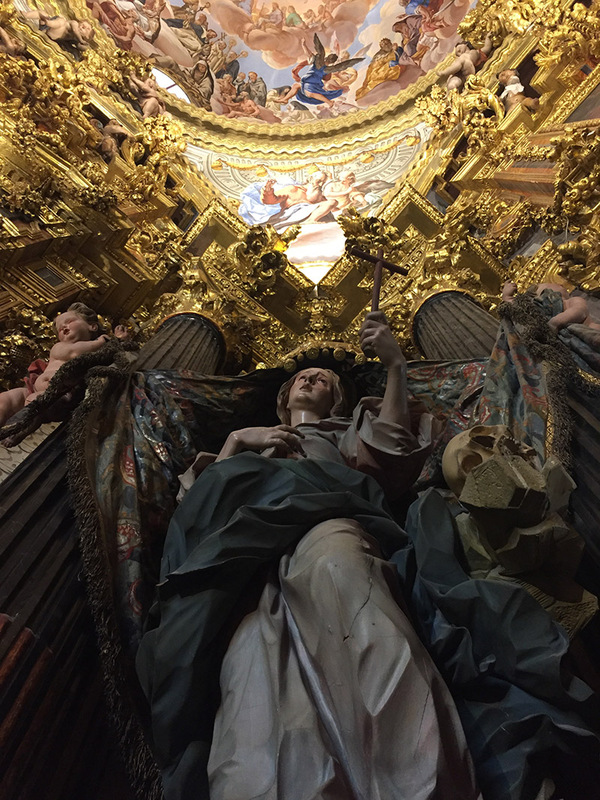 Too much of the baroque in one day is never a good thing…..
A nominal charge is made for entry to both the Real Monasterio de la Cartuja and the Casa del Chapiz, but both very much worth it!